Cities are like living organisms: They can change significantly over the course of their lifetime. People come and go, neighborhoods rise and fall, businesses start and fail, all of which have a significant impact on residents — especially when it comes to their finances. 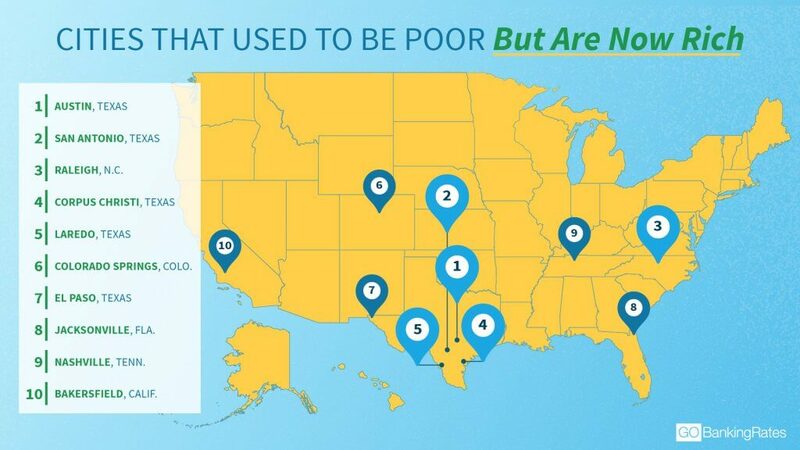 GOBankingRates conducted a study to determine which U.S. cities used to be poor and are now rich. Using U.S. Census data from 1970 and the 2016 American Community Survey, the study analyzed per capita incomes, household incomes and poverty levels, and the respective change in all three over time. Keep reading to find out which cities saw the greatest change in wealth over roughly the last four decades, and see just how affordable these places are today. Incomes — both individual and household — increased dramatically in these cities, as did their resident populations. The average growth in population was 326,080, or approximately 206 percent; and the average increase in household income was $25,409, or about 109 percent. Texas is home to six of the top 17 cities that have become richer over the last 40 years: Austin, San Antonio, Corpus Christi, Laredo, El Paso and Lubbock. Laredo had the lowest household income in 1970 at $14,247, whereas Austin saw the greatest growth overall, from $24,621 to $60,939 — an increase of 148 percent. Seeing cities grow and flourish is all well and good, but there are always consequences for these types of changes. One of the most notable is the effect on housing and affordability. Prosperity brings more businesses and more people, which inevitably leads to greater demand for housing and thus higher home prices. According to Zillow’s latest data (March 2019), the median rent for the U.S. is $1,650. Out of the 17 cities where incomes have increased, 15 of them have median rents below the national median. The cheapest of the top cities is Greensboro with a median monthly rent of $999, whereas Austin is the most expensive at $1,695 a month. Click through to see the best places to live if you’re trying to save money. All rent prices (sourced from Zillow) are accurate as of March 2019. All other information in this article is accurate at the time the study was conducted in July 2018.